The second year of the FIA World Championship commenced with two key questions; could Alfa Romeo maintain its supremacy against Ferrari and would its thirsty supercharged engines be able to beat the new conventional 4.5 litre Ferraris. The key to both was the new and glorious 405 bhp Alfa Type 159. The supercharged engine burned methanol at the rate of 1.5 miles to the gallon. This meant two pit stops in a 300-mile race and the extra fuel tanks didn't help the handling. The opening grand prix was a short 190-mile race on the dangerous tree-lined Swiss Bremgarten track on a wet and rain-soaked day. Juan Manuel Fangio proved to be the master in the appalling conditions. But the Argentine ace didn't have it all his own way because both Piero Taruffi in the Ferrari and defending champion Nino Farina in another Alfa made him fight all the way. Fangio built up a 40-second lead but then his fuel stop cost 33 seconds so that the top three were racing close together on the tricky public roads. As the race wore on Fangio pulled away to win by almost a minute while behind Taruffi got the better of Farina and thus split the top two Alfas. The superstitious Fangio had been rattled before the race after running over a black cat in practice and had slept badly. Consalvo Sanesi came home in fourth place, a lap ahead of Baron Toulo de Graffenreid with Ascari sixth out of the 14 finishers. 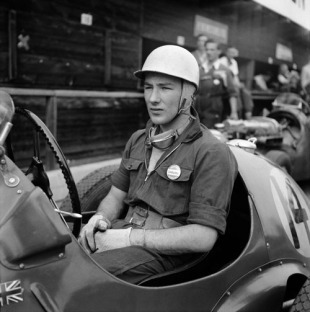 Best of the three British drivers was 21-year-old rookie Stirling Moss, who finished eighth in an HWM-Alta.